Have you ever wanted to know more about a specific word in the Bible, what it meant in the original languages? For some people, the answer is: Nope! But, for others, the answer is: Yes! Give me more! In Young Life, we speak the language of teenagers. It is a language that we typically have keep up with since it changes all the time. We work hard at it and knowing the language of teenagers helps us achieve our goal of communicating clearly the great news of Jesus Christ. Our English language is fortunate to have a wide-range of excellent translations from the original languages of the Bible. Yet, sometimes English can’t capture all of the nuances of a different language. For instance, you may have heard that the English word “love” has several meanings in New Testament Greek (though sometimes the differences are pushed too far). Identifying the precise meaning of a word is one reason why you might be interested in doing a word study in the original languages of the Bible. Just a note: These videos are really only the tip of the iceberg on this topic and only utilize free resources available online (which aren’t the best or most updated). 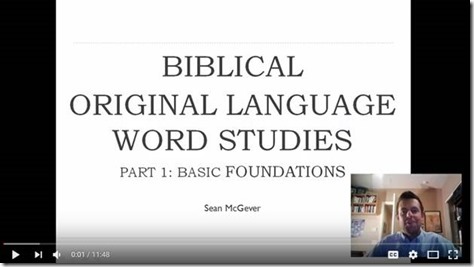 Yet, the videos will give you a good introductory understanding and skill set to learn more about how to do original language word studies in the Bible. I hope they are helpful as you share the great news of Jesus Christ. PS: Thanks for all the encouraging messages about the One Year New Testament. I’m excited so many college freshman groups, leadership teams, leaders, and kids are using it! PPS: If you are looking for some campaigner resources, you might want to check HERE.